SHIMANO'S Backbone Elite rods have been very popular with the offshore game fishing set, delivering a range of line class options at really good prices. And the 2018 lineup has just been given a well-deserved tweak. 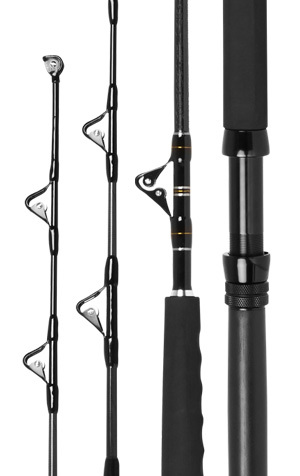 There are eight rods in all; a 10 kg stick with fixed guides and a roller tip, and three 15 kg options in a selection of fixed guides, fixed guides with a roller tip, or fully rollered. The same choices are available in 24 kg, and finally there’s a serious 37 kg weapon with a roller tip. Of single-piece construction and 1.7 m (5’ 7”) in length, the Backbone Elite blanks now utilise Shimano’s legendary TC3 material, which is the same three-ply graphite weave the early Tiagra Game Series rods were built on. The long EVA fighting foregrip has a new shape, which delivers a comfortable grip even in wet hands and the guides, whether fixed or roller, are from Pacific Bay. The Slick Butts are durable and make it easy to remove a loaded up rod from a holder, while anodised aluminium reel seats and gimbals round out a very workmanlike package. The cosmetic has also been upgraded to a traditional game fishing colour scheme of black, gold and silver, making these rods an even sweeter pairing with Shimano’s TLD and Tyrnos lever drag reels.